This course is one of a series entitled Helping the Planet. Each course is complete in itself and teaches skills that you can add to whatever other ways you enjoy using, whether practical or spiritual, to help the Earth at this time of great change. An underlying principle to all of these courses is that any help you offer to the Earth and those who share the planet with us also brings growth to you. In each course you are guided to focus on aspects of your own inner light and as you do so your light becomes more available to you and your radiance grows. As your radiance increases it is important to be able to place it in the world, for the light of your being has consciousness and it loves to serve. Offering your radiance to the Earth can be a wonderful way of fulfilling this purpose and enhancing your light further. Heaven on Earth also offers further courses that build on this series. A reminder: Do not listen while driving. Since these meditations may take you into deep states of relaxation, do not listen to them when driving or doing anything, such as operating machinery, that requires you to be alert and focused on the outer world. Before listening, choose a time when you can be relaxed and undisturbed for about half an hour. Notice your posture; sit with your spine comfortably erect. If you prefer, you can listen lying down, again with your spine comfortably straight. As you listen you will be receiving many transmissions of light and love from your guardian angel and from Sananda. After the meditation finishes you may like to spend a few minutes absorbing your experiences as you come back fully to the outer world. 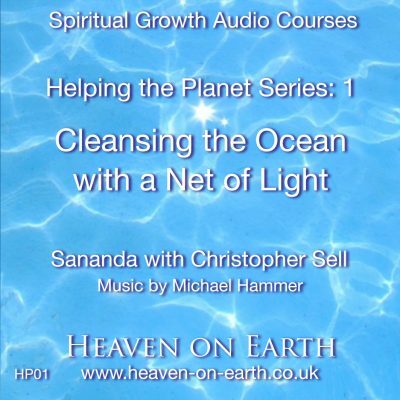 Listening to these meditations several times is likely to enhance their effect. Trust your intuition in choosing when and how often you listen to each one. You will find further suggestions in the What’s next? section. Sananda directs you to a sacred space where you meet your guide. He helps you to connect with your guide’s light and love using three of your main energy centres, the heart, the crown and the third eye. With your guide’s help you strengthen your connection upwards to your soul. Sananda guides you to merge your own consciousness with that of a whale and then to travel together to the heart of the star Sirius. As you merge with the whale you begin to explore the whale’s relationship with Earth. The cetaceans, whales and dolphins (one source suggests the whales are the higher selves of the dolphins) are seen as playing a role of planetary guardianship. At this time humanity is beginning to take on this role, in part so that the cetaceans can move on to their next level of growth. You also begin to explore the relationship of whale consciousness to the cosmos, represented here by Sirius. Whales and dolphins are said to have a special connection with Sirius, one of the closest stars to us, and the brightest in the sky. The Sun and Sirius also have a special relationship, in some sense like siblings. For humanity too the link with Sirius as well as other stars in our local region of the Galaxy, such as the Pleiades and the stars of the Orion system, seems to have a deep resonance in our psyche, which can manifest in the form of past life memories or spiritual traditions such as those of ancient Egypt. One of the Ophanim Angels, whose purpose is to help you know yourself more fully as the creator of your reality, introduces you to the network of light that the Ophanim hold around the planet. You could think of angels simply as beings of pure light whose purpose is the serve the highest good or Divine Will. Different kinds of angels play different roles in that overall purpose. The Ophanim Angels are also sometimes known as Wheels (the word ophanim means wheels). You may experience their light as being very dynamic, perhaps spinning in a wheel-like way. In this meditation you encounter them as the angelic overseers of the network of light (sometimes also called the Gridwork of Light) which is developing around Earth at this time. If you imagine the network as being made of intersecting lines of light, then you could also think of those intersections as being places where the light is particular dynamic, and perhaps especially resonant with the Ophanim. Returning to the network of light you meet the incoming souls of the new children and then journey back to the womb to connect with the soul of your mother as you accept more love from the soul of the Earth and a gift of light from the Ophanim. Many beings are contributing to the network of light, amongst them those who are coming into our world now as the new children. Many of the new children bring with them a vision of the Earth renewed, of harmony and balance restored. “To Hopi, children are the natural healers of the manifest and unmanifest world. From the beginning, we have called upon them, day-to-day, to restore and sustain the harmony and balance upon which the Hopi and the world depend. They bring fresh attachment to life and the future, hope to what is ever-coming to be. Peace among peoples and cultures, health and purity in nature, love and hope within our homes all depend upon this hopeful healing nature of children. It is in learning through them that we come again to restore our true selves and to create the daily balance by which we and all life are sustained. By linking with the new children in the network of light we help create a continuity of purpose, supporting them and receiving their support also. We began this life in the waters of our mother’s womb, nourished by her. So this inner journey helps us to renew and heal that relationship and, as it does so, to purify our relationship with the Earth and her waters, for in another sense the Earth is our mother; our physical bodies are formed from the matter of the planet, our life is dependent upon the food Earth provides. Becoming one with the net of light, you are guided to merge with the ocean, to become the ocean and to become the light as the star Sirius and the Sun transmit light to you and through you to the Earth. In this meditation you are guided to form multiple connections: with whale consciousness, with the Ophanim Angels, with the new children, with the soul of the Earth, until you may begin to experience yourself as part of the great network of light. Then you begin to merge with the waters of the ocean; perhaps you might think of water as a kind of condensed light. The light and love of the Sun and Sirius spiral together through the core of your being, creating a vortex of light which you allow to release outwards through the oceans. After you’ve listened several times to these inner journeys, practise using these skills without the recordings. Give yourself time (perhaps longer than when you are using the recordings) to become centred and relaxed. Though your mind may not become completely still, let your thoughts settle. Explore whichever connections you feel most drawn to, whether the whales, the angels, the incoming generations or the soul of the planet itself. As you explore you will make your own discoveries. Know yourself as part of the planetary network of light. Be open to insights about how you can help the planet in ways that are truly joyful to you. You may like to follow up your interests with further related Heaven on Earth courses. Special thanks to Michael Hammer for permission to use his music on these recordings. You can buy it through http://musicstore.michaelhammer.net.